In the spirit of the season, I'd volunteered to bring deviled eggs—from Mike and Linda's pasture-raised hens at Terra Farma, which have launched into spring production recently—along with a potato gratin of some sort. I'd considered a leek-and-mushroom version, but a heavy, creamy dish, while delicious and totally appropriate for grilled lamb chops, just didn't seem springy enough. 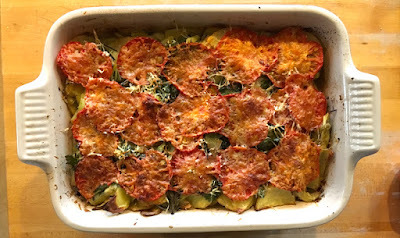 So I turned to a version I'd concocted based on a recipe by Patricia Wells, renowned author of cookbooks drawn from meals she served at her home in Provence. Hers was a gratin meant to be cooked in the oven under a leg of lamb, the juices from the haunch dripping down into the potatoes as it roasted. 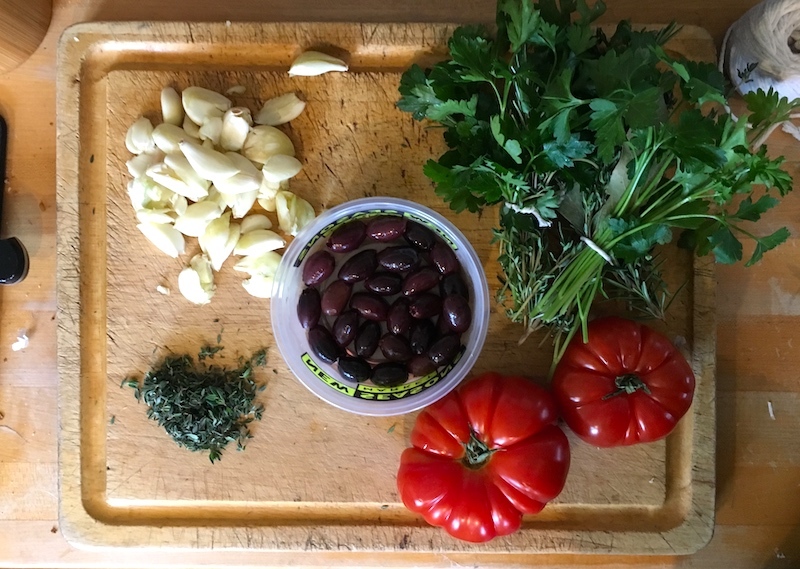 My version eschewed the lamb juices—don't get me wrong, I love this method, which works with roasted chicken, as well—but kept the rest of the ingredients, adding a couple more for a Mediterranean-ish dish that would sing with the lamb chops. Not to mention that it would also be terrific for a simple summer grill with fish or chicken, or a rich vegetarian main dish with a salad alongside. Bring a large pot of water to boil on the stove. Put sliced potatoes in the hot water, and when it returns to a boil cook for no more than 5 minutes. Drain in colander. In a large mixing bowl, gently combine potatoes, garlic, olives, artichokes, thyme, fennel pollen, olive oil, wine, salt and pepper. Stir to coat the potato slices evenly. Pour into 9” by 13” baking dish. Nestle the four bouquet garni, spaced evenly crosswise, into the potato mixture. Scatter a layer of tomato slices over the top and sprinkle with the cheese. Bake for one hour. 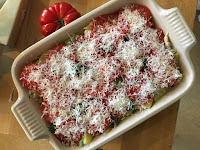 Remove from oven and gently pull out the bouquet garni, trying not to disturb the tomato slices too much. Serve. Note: To prepare fresh baby artichokes (step 1 and 2 only).